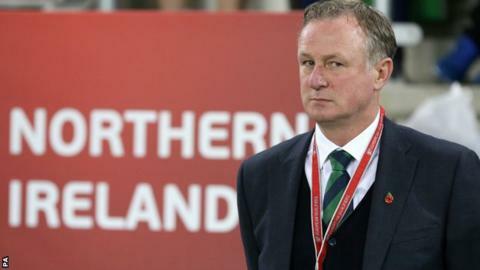 Northern Ireland boss Michael O'Neill has turned down the chance to succeed Gordon Strachan as Scotland manager. The 48-year-old had been the Scottish Football Association's preferred candidate for the role. Former Brechin City and Shamrock Rovers boss O'Neill said he had "given the matter a great deal of thought". "It's a huge honour to be offered the position, however I do not feel that this is the right opportunity for me at this moment in my career," he added. Scotland manager's job - who's next? SFA chief executive Stewart Regan said: "The process of identifying and recruiting a new Scotland national coach remains ongoing." Regan said O'Neill was identified by the sub-committee appointed to oversee the recruitment process as an "obvious candidate for consideration"
He added: "We requested permission to speak to Michael from the Irish Football Association, which was accepted. Michael and his advisers met our delegation in Edinburgh on Thursday and discussed all aspects of the role during a three-hour meeting. "While this was a positive and cordial discussion, we respect Michael's decision to remain loyal to Northern Ireland, with whom he has enjoyed great success. "We continue our recruitment process from the candidate list established by the selection committee, with a view to giving the new national coach ample time to prepare the squad for the Uefa Nations League." Having led Northern Ireland to the last 16 at Euro 2016 and the World Cup play-offs, O'Neill has been offered an extended contract. He is contracted until 2020 and the proposed new deal would run until 2024. Talks are advanced on the proposed new contract and are expected to be concluded in the coming days. The Northern Irishman has had a long association with Scottish football after playing spells at Dundee United, Hibernian, Aberdeen and St Johnstone. Strachan had a near five-year spell in charge of Scotland but could not lead the national team to their first major finals since the 1998 World Cup. Craig Brown was in charge of that campaign, and Berti Vogts, Walter Smith, Alex McLeish, George Burley and Craig Levein held the post before Strachan. McLeish said in December that becoming Scotland manager for the second time "would suit me very nicely". SFA performance director Malky Mackay took charge of Scotland's senior team for the November friendly defeat by Netherlands, and their next game will be at home to Costa Rica on 23 March. Further friendlies follow against Hungary in Budapest (27 March), Peru in Lima (29 May) and an unconfirmed side preparing for this year's World Cup in Mexico City (2 June). Scotland will then face their inaugural Nations League campaign in September, the draw for which takes place on Wednesday. There's no way of looking at this other than it being a huge blow for the SFA operationally and for its reputation. The Northern Ireland manager was the preferred candidate from day one and, despite putting its biggest ever managerial financial package on the table, the SFA failed to get its man. The reasons for that will be analysed internally, but searching questions will also follow publicly when the SFA responds. Attention will now turn to a Plan B, but it may well be a tricky sell given the job has already been turned down. There's little reason to rush given the lack of forthcoming meaningful games, and it may well suit those at Hampden to let the dust settle on this saga first.